If you’re in need of a fairly easy but delicious Super Bowl party appetizer, I have just the thing. Pair with some ice cold beer and everybody’s going to have a fantastic day no matter what the score is. Every once in a while, I just throw something together for dinner and it turns out to be a total win. 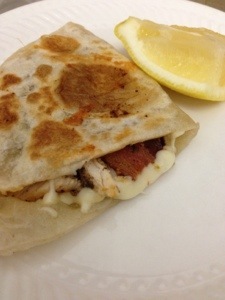 These quesadillas are the result of such an occasion. 1. Rinse chicken and pat dry with a paper towel. 2. Rub both sides of chicken in spices. 3. 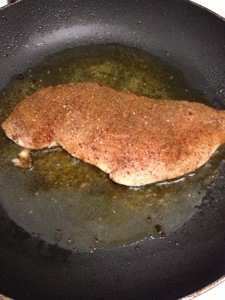 Heat a small amount of canola oil on a pan and add chicken once hot. 5. Once chicken is white on both sides, squeeze lemon over chicken. Cook for a few minutes, flip, and squeeze lemon on the other side. You can check that the chicken is cooked all the way through by cutting in half. If its white and the juices are running clear, it’s done. Don’t over cook it! 6. Cook bacon and set aside. 7. Cut chicken into strips and then shred it further with your hands. 8. In a separate pan, heat a small amount of canola oil and lightly cook each tortilla half. 9. 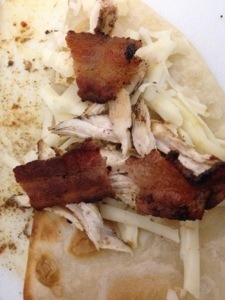 Put shredded pepper jack, shredded chicken, and bacon pieces on one side of the tortilla and fold in half. 10. Put back on pan and heat on each side until cheese is melted. 11. Serve with plain Greek yogurt or sour cream. Pinterest is a great resource for recipes, but sometimes direct links are missing or lost. When that happens, you’ll see a great picture and description, but when you click on the image, it doesn’t link directly to the recipe. Sometimes it doesn’t link anywhere at all. 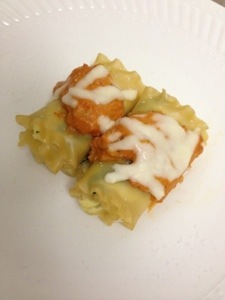 That’s what happened when I found this great step by step photo of mini lasagna on Pinterest. No link. 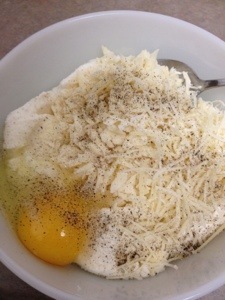 But since there was a picture guide and I had the ingredients, I decided to give it a try. 2. 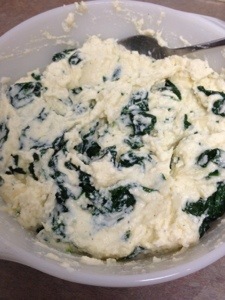 Mix cooked spinach, cheeses, egg, and seasonings in a bowl. 3. 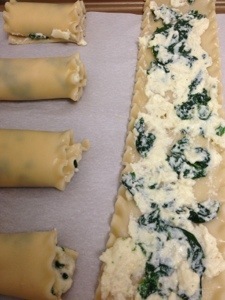 Drain noodles and cut in half. 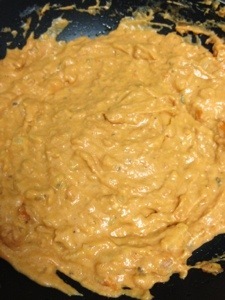 Spoon on mixture and spread thinnly all over one side. 5. Bake at 375 F for 20 minutes. 1. 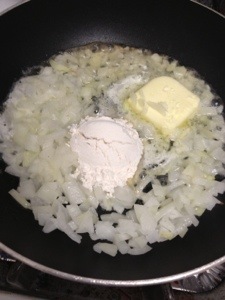 Melt butter on a pan and sautee onions until translucent. Add flour and mix. 2. Pour half n half and whisk until sauce thickens. 3. Add tomato paste and seasoning. Stir until combined. 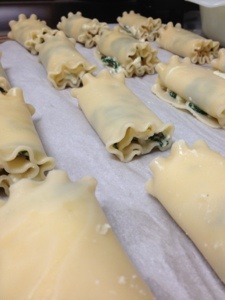 Once the tomato paste is ready, top each lasagna roll with it and a little bit of shredded mozzarella. Bake lasagna for another 2-3 minutes. I served my lasagna with a salad with balsalmic vinegarette dressing and sauteed Japanese eggplant. 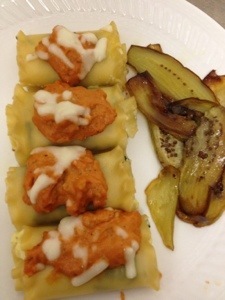 I think I like this dish better as an appetizer but it worked well as a Meatless Monday dinner.